The peregrine eggs at the Cathedral of Learning nest are due to hatch at the end of this week, but here’s a word of caution: You might not want to watch. My calculation says that hatch day for Hope and Terzo’s eggs will be this Friday April 13 or Saturday April 14. However, it probably won’t be a happy event. Hope has a habit of killing and eating some of her chicks just after they pip. Her behavior is very rare and upsets nearly everyone who sees it. Hope has a history. We hope she won’t repeat it this year. p.s. After hatching is over, Hope becomes a good mother. She fledged 1 youngster in 2016 and 3 in 2017. I watched the last two years but I won’t watch this year. I’ll wait a few days. Like you say, after the hatchings she’s a great mom so I will tune in eventually! Thank you for the heads up. I forgot about her bad habit. Fingers, toes, eyes, etc. crossed that she behaves normally this year. Maybe she’s learned a thing or two. Fingers crossed. I was watching around 7:45 4/13 and she got up & tipped her dead down towards the pale egg like she was hearing a chick & it looks like a pip might be forming. So maybe we will have a hatch later tonight or tomorrow. 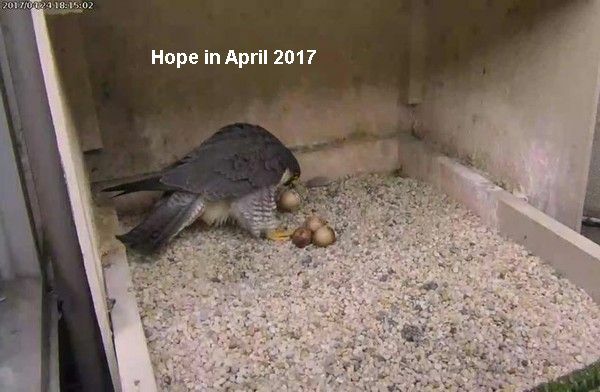 when I went back to the website she was again standing over all 4 eggs with her head tipped down looking at the eggs like she was expecting them to hatch.